Amazing variety within easy reach. Montenegro offers it all: from the miles-long beaches of the Ada Bojana to the high peaks of Durmitor; from Europe’s southernmost fjord to its deepest canyon. Feel, taste, and discover the land of the Black Mountains – led by a knowledgeable guide or as an individual, self-guided traveler. 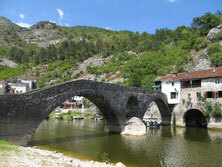 Although Montenegro is small, it has no less than 5 national parks, each of which has its own distinctive character. The "Boka Kotorska" is the only fjord in southern Europe. Here, nature and culture present a unique synthesis. The interior of the country just behind the coast – including the old royal city of Cetinje and the small villages on the banks of Lake Skadar – is the heart of the historical principality of Montenegro. Population: Montenegrins (45%), Serbs (29%), Bosniaks (9%), Albanians (5%), Croats (1%), Other. Religion: Orthodox Christians (72%), Sunni Muslims (16%), Roman Catholics (1%), Other.